We purchased a few goodie-bags of assorted organs from Da-Le Ranch a while ago, and finally got around to starting to make use of them this week. Pictured above is a Lamb's Liver dish we cobbled together from recipes in several Portuguese cookbooks. The liver was marinated in white wine and lemon juice, cooked in bacon fat, sauced with the reduced marinade, topped with the bacon, and served family-style over sauteed onions. We really enjoyed the way it turned out - it had a fantastic depth of flavor. 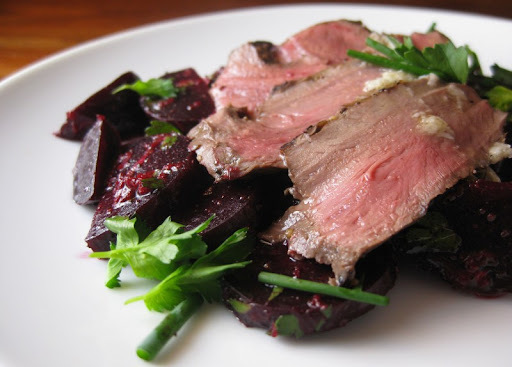 We used a Chris Cosentino recipe for grilled heart with roasted beets and horseradish. It called for beef heart and golden beets (we used red) but I'd guess that Chris wouldn't mind the substitutions - he'd probably just be pleased to see someone cooking heart. All of the elements came together really well. We had it as a main dish, but it would probably be better as a starter as the beets get a bit overwhelming after a bit. 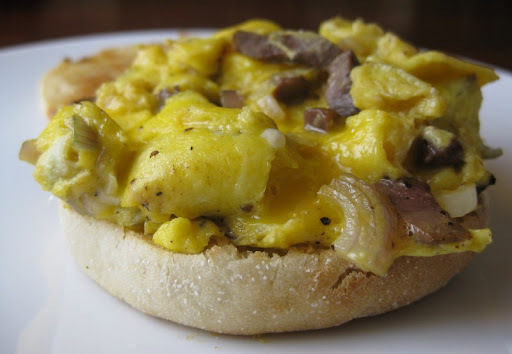 This wasn't the first time we've had "offal eggs", and it definitely won't be the last. We also made a pâté with leftover liver and a bit of heart. We haven't tried it yet, though - we plan to use it for Banh Mi. I'd duggest soaking the kidneys (after taking the membrane off and removing the hard white part inside) in milk for a day, then grilling them. Serve with lemon and olives and crusty bread. 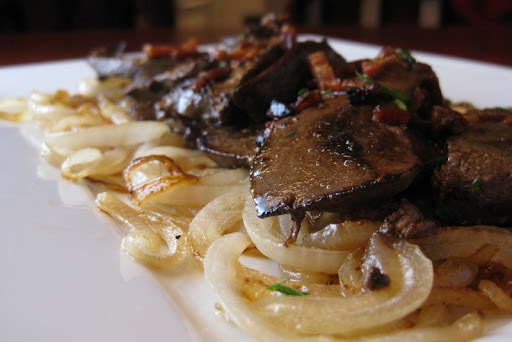 Always looking for new offal (and especially pig offal) recipes, so thanks for the lead! Hunter - I don't think you'll see it at your local drive-thru any time soon... Thanks for the kidney advice! Courtney - yeah, it can be hard to find recipes. We couldn't really find anything for pork heart (even Fergus Henderson failed us) - hence using the beef heart recipe. Your grilled heart sounds wonderful. I found a pig heart recipe online some time ago and we now use it for the first pig butchered each season: Contrary to what it says, it barely serves 4 & we double the quantity of potatoes. Serves 4-6 From chefs John Stewart and Duskie Estes of Zazu Restaurant & Farm and Bovolo. 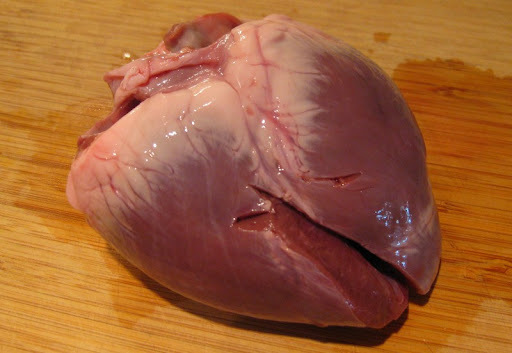 To cook the heart, bring all the ingredients to a simmer together on the stove for 2 1/2 hours. Let cool in the liquid in the refrigerator. Once completely cool, cut the heart in half and slice as thin as you can. Gently toss with marinade ingredients just to combine. Bring the potatoes, water, and some salt to a simmer, until just done, about 40 minutes. Let cool at room temperature. Once cool, cut into bite-size pieces. Toss with olive oil, vinegar, olive oil, grain mustard, salt and pepper. Adjust to taste. To plate: In a shallow bowl, spoon some of the potato salad, top with the marinated pig heart and garnish with more extra virgin oil. The marinated pig heart will hold for several days in the refrigerator. Blue Feather Farm - thanks for sharing the recipe! We'll definitely give it a try the next time we have pig heart on hand.